I still have photos and a BreyerFest report to make, but I thought I’d pass along this picture showing the start of the Oliver master mold. Oliver and his mother Elsie, both sculpted by Sarah Minkiewicz-Breunig, are new releases for 2010. Oliver’s master mold is part of the reason I am behind on my posting. Work on it was interrupted for back-to-back trips, first to Kentucky and then to Alabama, so I’ve been eager to finish the project before I hit the road to Ohio in a few weeks. In this picture he’s being prepared for the pouring of the first large side. 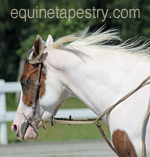 The claying up isn’t completely finished; the edge along his topline has to be brought up tight to the original. This is important since it determines how tightly the mold will fit, and therefor how much (or how little) flashing will be present on the castings. Extra time spent getting this part right means less time spent later. The rest of the mold keys (the indentions around the outside) have yet to be cut and the outer edges still need to be made square and true. 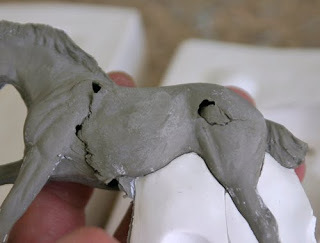 Unless there is trouble getting a rubber casting, this is usually the most time-consuming step. Fortunately this is a very straight-forward mold to make, so I don’t anticipate any trouble. I was pleased to see that he even fits within my favorite set of mold boards, which are smaller and easier to handle. Elsie is a tight fit even for my largest set, so I suspect I’m going to need to get my husband to make a bigger set before I start working on her mold. I should probably break down and have him make them from plexiglass like this set Joan has, because being able to see through the sides is really useful, and the clamps don’t gouge them. If only everything could be molded with Legos! 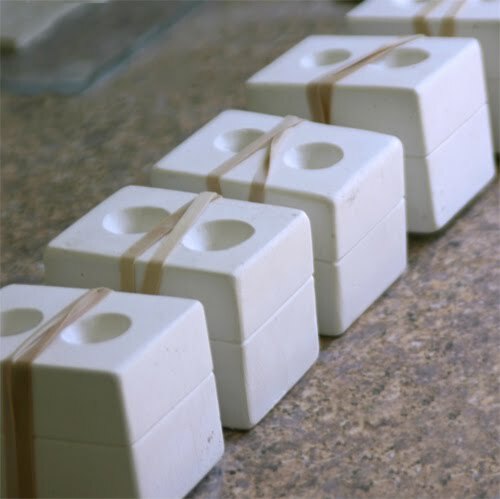 They don’t have the strength for larger molds, but for smaller projects they are faster. That was how I could make ten new molds for the cabochons used in the previous few posts. With just one functioning mold and really humid weather, I could only cast two beads in a day. That wasn’t going to work, since they are the sort of thing that only makes sense in large batches. I made the new molds just before I left for Kentucky, so they are now dry and ready to use. My plan is to experiment with glazes on the cabochons and the Flying Hearts Fundraiser tiles during the rubber cure times. I swear the hardest part of moldmaking for me is leaving the rubber long enough for it to properly cure. I’m always dying to see if it really worked! So a distraction is a good thing. 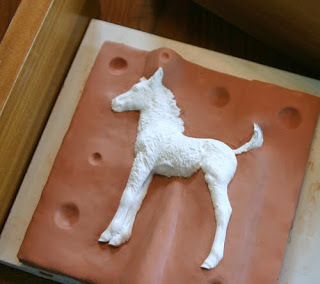 If it all works out, I’ll have Oliver and Elsie plaster molds drying and a fully stocked Etsy store by fall. The only remaining pieces (aside from the large side) are the two back gusset pieces, which are tinted pink in this picture. 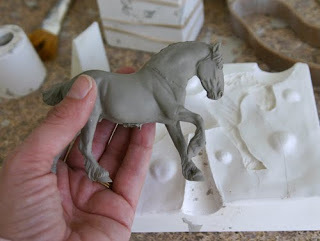 These two pieces are designed to lift up with the casting, with the horse balanced on top like a pedestal. This is the way most horses are removed. The two front gusset pieces came away really clean, so they didn’t need an adjusting. But while the first side came off easily and the two front pieces came away clean, the casting was still a little too soft to be considered leather-hard. Normally I would set everything aside at this point to let the casting firm up a little. That’s because to break the seal on the other large side, I’m going to need to rock the casting a bit, and I don’t want to risk collapsing the barrel, shoulders or chest. But since this casting is already lost, I went ahead and tried to remove it to show what happens when a casting is removed too soon. Here he is on the gusset pedestal, showing how pulling the casting while it was still pinned to the side pieces caused the piece to rip apart. 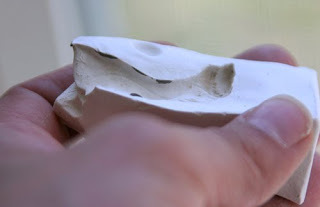 The two bits of stuck clay show where the casting had not yet dried enough to release from the mold. Fortunately it was the clay that was too damp, which is relatively easy to clean up with a fine (dry!) sponge. 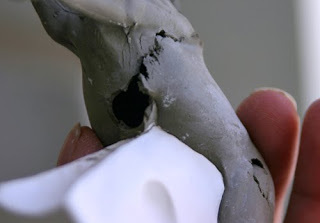 If the mold itself had still been damp, it might be impossible to completely clean the clay from the mold. 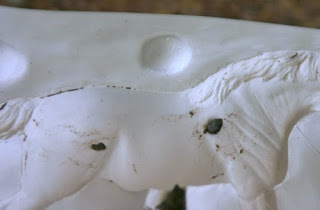 Patience really is one of the most important qualities in slipcasting! Even though my casting was badly damaged, I was still able to wiggle the two back gusset pieces free so that I could check for flashing. 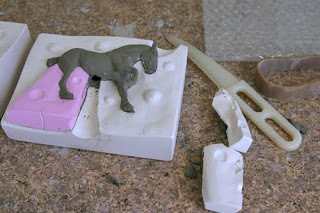 Sure enough, both hind legs had scraped clay showing where I needed to correct the molds. It’s hard to believe that a casting like this is a success, but it was because I was not after a usable bisque. What I wanted was information, and this first casting provided it. 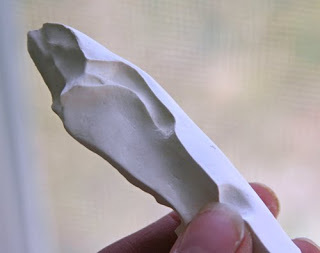 By looking at how the casting was going wrong, and adjusting the mold pieces accordingly, I was able to fix the mold so that future castings were easy to get. 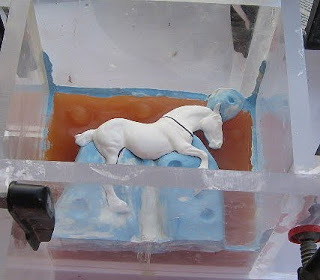 Here is the second casting from that same mold, poured to double-check that I caught any potential problems. As you can see, the mold is clean and he came out whole, so I can declare this a working production mold.